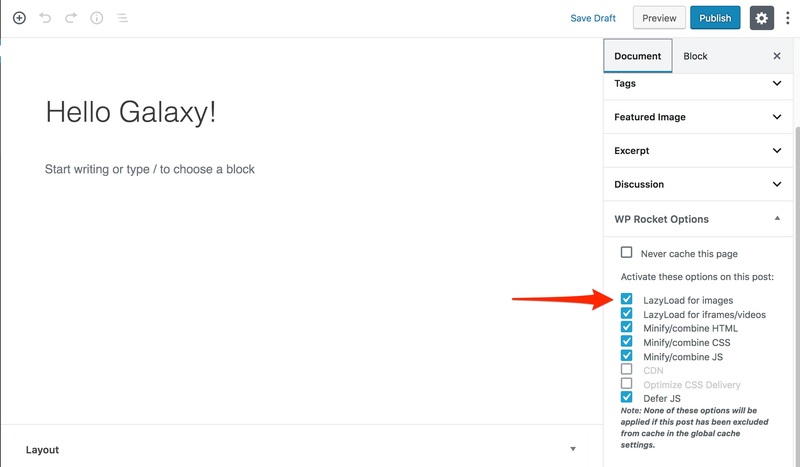 If you want to disable LazyLoad on a specific post or page, you can do so directly on the Edit screen using the WP Rocket Options meta box. Un-check the LazyLoad option and publish or update the post. Note: This option will only be enabled if LazyLoad has been globally activated in Settings → WP Rocket → Basic. The option was added in WP Rocket 2.5. In case you run an older version, our recommendation is to update to the latest version. Heads up! You must delete the functions you don’t need before running this plugin, otherwise LazyLoad will be deactivated on single post pages, product pages, and search result pages. Below are a couple of examples on how to come up with your own function. The front page of your site is the one set in Settings → Reading → Front page displays. It can be an actual page, or an archive page with your latest blog posts. The blog page of your site is the one displaying an archive of your recent posts. It can be the front page, or any other page you have set to display such archive in Settings → Reading → Front page displays. A Single Post is the page you see when you open the permalink of a post. The required function is included in the plugin. A Product Page in WooCommerce is the page you see when you open the permalink of a single product. The required function is included in the plugin.